I looked out the window from my room at the tiny hotel in Pucon, Chile. The rain gave me reason to pause. I could always leave tomorrow. Sometimes we do what we wanna do, not what we oughta do. I wanna go back to bed, but I oughta get on the road. There’s never a “right” time. There’s just this time. I slowly dressed and packed my BMW GS 1200 adventure motorcycle. The forecast was rain all day. 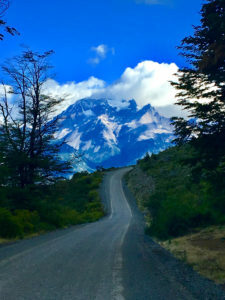 I must head south for Puerto Montt, Chile and the gravel roads of the Austral. No more putting it off. The road called, weather be damned. All tucked into my rain gear, I was warm and dry. Every inch water proofed. My water proof tout bag was not water proof. Maybe fifteen years is too long to expect it to be. I had bought a roll of trash bags that kept things high and dry. The first thirty minutes was a brutal downpour and then the sun came out. I started to sweat from all the rain gear. Thus always begins a cat and mouse game of whether to take the rain gear off or leave it on. Take it off, it rains. Leave it on, it doesn’t. I spend most of my time with my mind wandering. Sometimes it’s a providential prayer. Other times, I listen to my extensive playlist of music. On this day I’m listening to Darden Smith’s best album, Field of Crows. Still others, I contemplate the meaning of life. What if I take this road, or that road. We all face that question. What if it didn’t matter? A series of ferries begin south of Puerto Montt. The rain never totally lets up, and with gravel roads, there is a mixture of mud and rain and more mud. I focus on the splendor as I pass one beautiful mountain after another. I stop over a rise to capture a rainbow stretching over the road, in a moment of sunshine. My iPhone 6 is always at the ready for a picture. The steady drone of the Iron Horse threatens to put me to sleep. 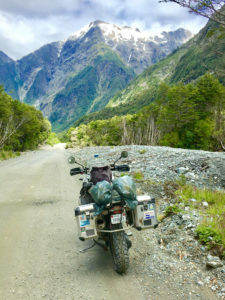 Wet and cold, I drudge deeper south down the long ribbon of gravel mud roads that is known as the Austral. The thing about gravel roads is it can go from good to bad in an instant. You must always remain alert. I vacillate between loneliness and solitude. On the open road is solitude. I’m free to enjoy the beauty that surrounds me without a care in the world. When I’m around multitudes of crowds, I feel lonely. Out of place. Like I’m the only one that doesn’t know anyone. It forces me to reach out and meet people. Listen to their story. But there are times to remain silent. I once went a week without uttering a word. I know because I never needed to put in my hearing aides. A fasting from talking. I imagined a world of deafness. Afraid of getting the language wrong, it was easier to say nothing. I find the ability to survive on sign language. Try it sometime, it’s very hard to do. But it gives you time to rejuvenate your thoughts. 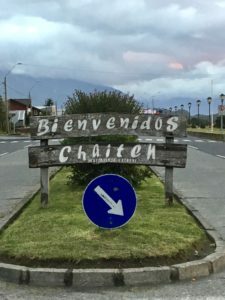 That night in the small town of Chaitén I rent a room. There are many houses with signs out front advertising rooms for rent. Someone turns a spare bedroom into an Airbnb. Only they leave the Air off the BNB. Signs in the front yards keep most inhabitants full of weary travelers all making there way down the Austral to the bottom of the world. Twenty-five dollars gives you a bed and access to a bathroom. My shared travelers on this night are Luis and Claudette from France. A married couple that are attempting to bicycle their way to Ushuaia, Argentina. After a week of camping in the rain, they decided to rent a room. There’s no way to pedal 70 km in one day from one town to the next by bicycle. Most nights are spent cold and wet in a tent on the side of the road. I thank God for the Iron Horse. Claudette laments that she is ready to throw in the towel. She’s had enough of 40 degrees and rain day after day. The next morning I pack the Iron Horse for an early start in the rain. I check the air pressure in the tires. I go a little lighter in mud and gravel. My 70/30 Continental duals are holding up nicely. There’s no sign of Luis and Claudette. Their bikes lean up under the overhang of the porch. Sitting patiently ready for the ride. Their masters contemplate their next move. I always wondered what became of Luis and Claudette’s journey. Chile is 4 blocks wide and 7000 miles long. I still had 2500 miles to go myself. Don’t think, Just go, I said to myself, as I turned the Iron Horse south.